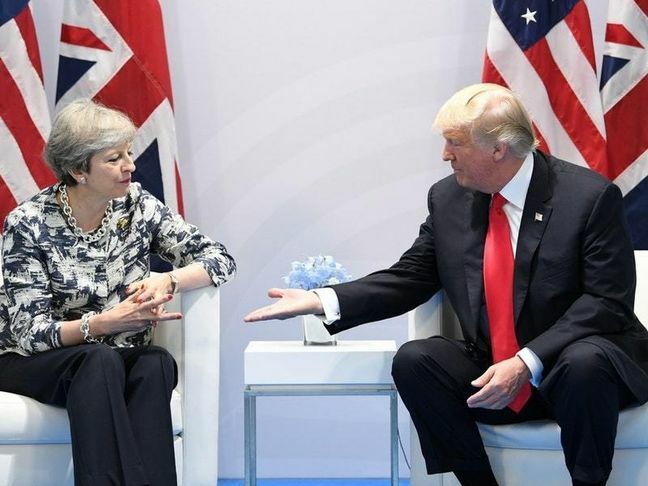 EghtesadOnline: Britain on Wednesday geared up for the arrival of Donald Trump just hours after the U.S. president waded into the Brexit crisis gripping Prime Minister Theresa May’s government and portrayed the closest U.S. ally in Europe as a country in turmoil. Trump lands in Britain on Thursday following a NATO meeting in Brussels where he chided Germany and other European nations for failing to contribute enough to defense spending, Reuters reported. His trip coincides with a tumultuous week for the British prime minister after two senior ministers resigned in protest at her plans for trade with the European Union after Britain leaves next March. May appears to have seen off an immediate challenge to her leadership from malcontents within her Conservative Party but Trump’s comments ahead of the trip - that Britain was “in somewhat turmoil” and that it was up to the people if she stayed in power - fanned the sense of political crisis. Trump also said he might speak to former Foreign Secretary Boris Johnson, who quit along with Brexit minister David Davis over May’s plans for a business-friendly Brexit which was only agreed by her cabinet last Friday after two years of wrangling. As May attempts to unify her party behind her proposals, commentators said Trump meeting Johnson would suggest backing for his view that May’s plans would inhibit Britain’s ability to forge new free trade deals. Securing a U.S.-UK deal post-Brexit is something both Trump and May’s government have heralded as being a major benefit of leaving the EU. Trump has long voiced his support for Brexit, saying it was part of a global uprising that ultimately thrust him to power, and he was at his Scottish golf resort the day after Britons voted to leave the EU, saying the outcome was a “great thing”. On Tuesday, the president described Johnson as a “friend” who had been “very nice to me, very supportive”, even though when Trump suggested in 2015 London had police no-go zones, Johnson, then the capital’s mayor, quipped he feared going to New York because of “the real risk of meeting Donald Trump”. “We’re extremely confident in the ability of the UK to plow through this issue with Brexit and move on,” he said. A high metal fence has been erected around the U.S. ambassador’s central London residence where Trump will spend Thursday night and the embassy sent out an alert warning Americans in London to keep a low profile in case protests turned violent. “It’s really kind of irrelevant to what we’re trying to do, and it certainly doesn’t express the opinion of the British people that I’ve met,” Ambassador Johnson said of the balloon. While the protests are taking place in the British capital, Trump will meet the queen at Windsor Castle where he will be welcomed with a guard of honor before having tea with the 92-year-old monarch.